Greetings again from the darkness. It’s often seemed as if Robert DeNiro existed in two unrelated cinematic worlds. He’s a 7 time Oscar nominee and 2 time winner (The Godfather: Part II, Raging Bull) renowned for his dramatic work, while also seemingly intent on proving he’s as funny as he thinks he is. His work in Analyze This, Analyze That, and the Fockers franchise takes “playing against type” to an extreme. This latest is his return, 35 years after The King of Comedy, to playing a stand-up comedian. Of course Jackie Burke (DeNiro) is no regular comedian. 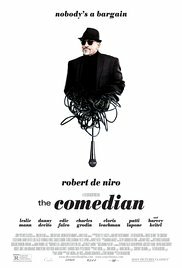 He’s pushing 70 years old, has anger issues, no close friends, a strained relationship with his brother (Danny DeVito) and agent (Edie Falco), and fights his popular legacy as “Eddie” from a decades-ago popular sitcom. He strives to be recognized not as Eddie, but as Jackie Burke, the king of insult comics. That anger lands him in community service where he meets Harmony (Leslie Mann) who is also serving her time. It’s kind of creepy to watch the 30 years older dude hit on her, but it’s explained away by her ‘daddy issues’ with Harvey Keitel. Of course, DeNiro and Keitel have a natural rhythm (that spans 5 decades of working together), but it’s really DeNiro and Mann who have the best scenes (outside of the unnecessary romantic interlude). Ms. Mann is especially fun to watch and brings a sense of realism to a film that’s mostly lacking. Taylor Hackford directs a script written by a blend of 4 writers: a Producer of Fight Club, a standup comedian, an Oscar nominee for The Fisher King, and a writer best known for the Kennedy Center Honors. It’s a weird mix that explains the periodic flashes of genius and the overall mismatched parts. There are no shortage of familiar faces that pop up, including Billy Crystal, Lois Smith, Jimmie Walker, Brett Butler, and Gilbert Gottfried. Patti LuPone is enjoyable in her role as DeVito’s wife and Jackie Burke-hater. It’s nice to see Charles Grodin in a Midnight Run reunion with DeNiro, and Cloris Leachman proves that comedy kills in her brief time on screen. Although there is a more cutesy humor segment at a retirement center when Burke leads the residents through a make-shift version of “Makin’ Poopie” set to the rhythm of “Makin’ Whoopie”, anyone seeing this should be braced for raunchy humor. Lots of raunchy humor. Jackie Burke is an insult comedian in the vein of Don Rickles, only he adds a dash of Jim Norton and Amy Schumer. With all the uncomfortable laughs, it might best be described as that rare film genre – blue humor for the blue hairs. Greetings again from the darkness. The only real determination of success for a comedy … does it make you laugh? If it makes you laugh, the movie has served its purpose for you. These movies are made for audiences, not film critics, which is why so few mainstream comedies play the film festival circuit. Comedian Kevin Hart has seemingly been EVERYWHERE the past five years. He is funny, hard-working and talented. Unfortunately, most of his film projects are elevated by his talent rather than the other way around. This first feature film from director and co-writer Jeremy Garelick has an interesting premise … a much better premise than HITCH … and benefits from an on screen connection between Hart and Josh Gad, despite scene after scene taking the cheap laugh rather than the smart one. Gad plays Doug, a socially inept nice guy who is marrying well above his pay grade. 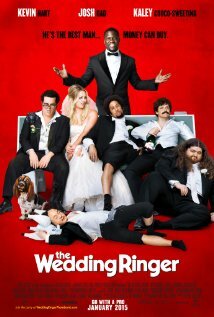 Kaley Cuoco-Sweeting (“The Big Bang Theory“) plays his fiancé – the rich girl forcing Doug to come up with 7 groomsmen for their wedding. Since poor Doug has no real friends, he jumps at the chance to capitalize on the services of Hart’s Best Man, Inc. Evidently there are so many men without friends that it’s necessary to have a business of best men and groomsmen-for-hire. There is nothing subtle or smart about the approach here, and the story line and ending are absolutely predictable if you watch the two minute trailer. Still, there are some very funny moments courtesy of Hart and Gad, and my guess is most viewers will enjoy a few laughs, even if they forget most of this once they leave the theatre. Supporting work is provided by Ken Howard, an on-fire Cloris Leachman, Mimi Rogers, Jorge Garcia and Josh Peck. Olivia Thirlby (Juno) plays sister to the bride, and it’s yet another example of a film wasting the talent of this terrific actress. Why is she always the friend, the sister or some other second fiddle role? In a bizarre football sequence, there are cameos from Joe Namath, Ed “Too Tall” Jones and John Riggins. Where the film missed a huge opportunity was in the casting of the “groomsmen”. Think back to Michael Keaton’s The Dream Team (1989) where Christopher Lloyd, Peter Boyle and Stephen Furst contributed laughter, rather than just the absurdity we get here from the groomsmen. The film is content hanging out in the middle as a no-apologies mainstream comedy, and has no aspiration for comedic greatness, or social commentary on the differing ideas of friendship between men and women. Still, the moments of laughter courtesy of Hart and Gad prove that making people laugh is a valuable talent, and laughter is good medicine … no matter how short-lived. Greetings again from the darkness. Tuesday night was a real treat for this movie lover. Thanks to the Dallas Film Society, Frost Bank and Alamo Drafthouse, the first in a Texas-themed film series was presented … The Last Picture Show. As I have stated many times, seeing the classics in a theatre goes far beyond reminiscing. It is experiencing the best of cinematic art in the forum its creators meant for it to be seen. Forty-two years ago, director and co-writer Peter Bogdanovich and writer Larry McMurtry (screenplay and novel) assembled a cast that blended veteran stage, screen and TV actors such as Ben Johnson, Cloris Leachman, Ellen Burstyn and Eileen Brennan, with an energetic and fresh-faced group of relative unknowns such as Jeff Bridges, Timothy Bottoms, Randy Quaid and Cybill Shepherd. It was the first screen appearance for Quaid and Shepherd (who had been a successful teenage model), as well as Sam Bottoms (Timothy’s brother) who plays Billy, the smiling, sweeping mute boy who so adores Sonny and Duane. Of course, Bridges had been acting off and on through his childhood thanks to his dad Lloyd, but this was his breakout role. It’s not unusual for this film to be pre-judged as some simplistic, outmoded black and white movie with no relevance to today’s world. In fact, a better argument can be made that this is one of the finest commentaries ever made on human nature, friendship, growing up, mentoring and personal dreams. You might wonder how a story that takes place in some tiny, desolate, wind-blown rural Texas town in 1951 (the start of the Korean War) has anything to do with society today. The small town setting actually strips away all distractions of today’s stories and focuses on what makes people tick … why they do the things they do. We see the strong, the weak, the disabled, the rich, the poor, the innocence of youth, the melancholy middle-aged and the impact our decisions and actions have on others. It’s easy to ask “why do they stay” or “what makes life worth living” in Anarene. Those same questions are asked by many people every day in any town or city you can name, regardless of size or location. This is also one of those rare movies that causes your outlook and perception to change depending on your age. 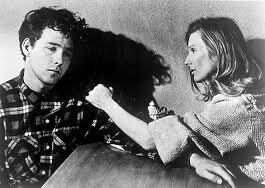 When I first watched, I was seeing through the eyes of Sonny (Timothy Bottoms), while now I relate much more to Sam the Lion (Ben Johnson). Not many movies have that kind of generational power. The film was nominated for 8 Academy Awards: Picture, Director, Cinematographer, Screenplay, Supporting Actress (Ellen Burstyn), Supporting Actor (Jeff Bridges), with wins for Supporting Actress (Cloris Leachman) and Supporting Actor (Ben Johnson). The French Connection was the big winner that year, and other nominees included A Clockwork Orange and Fiddler on the Roof. What a year! Ms. Leachman and Mr. Johnson (pictured left) are both heart-breakingly terrific in the movie. Johnson’s scene at the fish tank is mesmerizing and he perfectly captures the wistful wonderings of so many middle-aged men who feel like life has passed them by. I’ve often interpreted Sonny and Duane as the two sides of Sam the Lion (what he once was and what he is now). Johnson passed away in 1996, but used his wonderful slow drawl and strong presence in such films as The Wild Bunch, Dillinger and many John Ford westerns. Ms. Leachman (still working today in “Raising Hope” after striking it big in “Mary Tyler Moore” and Young Frankenstein) generates such empathy from the viewer as she re-discovers a reason to live. She is also the key to what I consider one of the most powerful closing scenes in cinematic history. As for the others, Jeff Bridges and Ellen Burstyn are both in their 5th decade of Hollywood stardom and have each won Oscars. Eileen Brennan has a very memorable moment in this film where she shoots one of those filled-with-disgust glares at Jacy (Shepherd). It’s one of those looks that only exists between one woman and another. Ms. Brennan (who passed away earlier this year) was Oscar nominated for her supporting role in Private Benjamin (1980). There are a few other things I like to point out in regards to the film. The high school teacher reciting Keats’ “Truth and Beauty” to a class who couldn’t care less is John Hillerman (a native Texan), who went on to stardom in “Magnum P.I.” in the 1980’s. Randy Quaid received an Oscar nomination just two years later for his work in the great The Last Detail. Of course, he later went on to star as Cousin Eddie in the ‘Vacation’ movies. Clu Gulager plays town lothario Abilene. He is the son of vaudeville star John Gulager, who worked with George M Cohan. Clu has had a long career in TV and movies and even appeared in last year’s Piranha 3DD … at age 84! The music in the film corresponds closely to the story and much of it is the work of the great Hank Williams, Sr. Check out the two versions of “Cold, Cold Heart” as they are performed by both Williams and Tony Bennett. Now THAT’s how you use music in a flm! Cybill Shepherd became a star thanks to her work here, then in Taxi Driver, and in the hit TV show “Moonlighting” (with Bruce Willis), her own show “Cybill”, and the Showtime series “The L Word”. She continues her work in both TV and movies. As previously mentioned, she began a very public affair with director Peter Bogdanovich while filming this movie. What many don’t know is that she was actually seeing Elvis Presley at the time, and chose Bogdanovich over the King of Rock and Roll. In 1990, director Bogdanovich revisited Anarene and caught up with the characters 30 years later in the sequel Texasville. While it’s based on Larry McMurtry’s novel of the same name, Mr. McMurtry was not involved in the production and Bogdanovich wrote the screenplay himself. Many of the original cast reprised their roles, but the film was not well received either critically or at the box office. 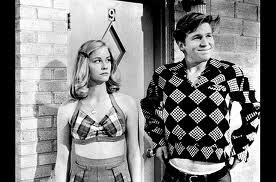 On the bright side, The Last Picture Show was selected to become part of The National Film Registry in 1998. Maybe the film deserved a happy ending after all. **NOTE: I have elected not to post the original movie trailer as it is my opinion that if you have not seen the movie, it’s best to view it with fresh eyes … in other words, the trailer shows too much of a few critical scenes. Westerns tend to be one of most divisive film genres. “I hate westerns” is proudly proclaimed by otherwise intelligent and open-minded movie goers. Ask these anti-western types for specifics on what it is they don’t like and their answers often include: boring/slow pace, hard to relate to characters, simplistic dialogue, too few women characters and too much machismo. Western lovers wouldn’t attempt to argue any of those points. Instead, we prefer to believe that some of those are the BEST features of westerns! What’s fascinating is, despite the haters, westerns have achieved immense popularity through the years. Some have provided us the strong, quiet hero: High Noon, Tombstone, The Magnificent Seven. Many have shown us the joy of revenge: True Grit, Django Unchained, The Searchers. Some provided us with wonderful villains: The Wild Bunch, Once Upon a Time in the West (nice guy Henry Fonda as a badass). Still others offered up the conflicted gunslinger: Unforgiven; The Good, The Bad and The Ugly. Westerns can even be tearjerkers: Shane; comedies: Blazing Saddles, City Slickers; and animated: Rango. The one western which seems to be the exception … it’s even beloved by western haters … is Butch Cassidy and the Sundance Kid. It’s a mainstream film with three movie stars, a strong director, a renowned writer, one of the best ever cinematographers, a love story, a #1 charting pop song, enough action (but not too much), and a level of comedy that is witty and quotable. Released 44 years ago in 1969, it was recently part of Cinemark’s Classic Film series. Paul Newman (Butch) and Robert Redford (Sundance Kid) charmed audiences even as they made their way through the west robbing banks and trains. 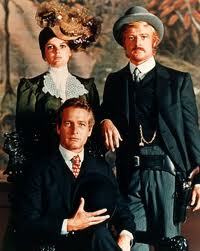 It’s interesting to note that Steve McQueen was originally cast as the Sundance Kid. Unfortunately, there was a disagreement over top billing and McQueen dropped out. Newman and McQueen wouldn’t work together until 1974 in Towering Inferno. On the bright side, Newman and Redford were terrific together and would team up again in 1973 for The Sting (Oscar winner for Best Picture). It’s no coincidence that George Roy Hill directed the Newman/Redford duo in both films. He was known as an “actor’s director” and recognized the mass appeal of these two. “Much of what follows is true” is our introduction to the film, along with a polychromatic montage of film clips and photographs of Butch and Sundance with The Hole in Wall Gang (renamed from The Wild Bunch, to avoid confusion with Sam Peckinpah’s recent release). 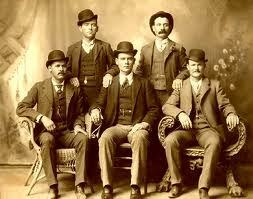 Butch (Robert LeRoy Parker) and Sundance (Harry Longabaugh) were real life outlaws in the early 20th century. The Wild Bunch is pictured at left. The real Butch is seated on the right, and the real Sundance is seated on the left. Of course, many of the facts from the wild west have been displaced by colorful legend and lore. It’s apparently true that their holdups rarely involved violence and they were in fact pursued by a posse, which in the film is portrayed as the Dream Team of posse’s assembled by Mr. E.H. Harrison of the Union Pacific Railroad. One of the first real scenes in the movie has Sundance playing poker and being accused of cheating. And we all know what that means in a saloon card game – it’s time for a gunfight. The young stud making the accusations is none other than Sam Elliott, making his big screen debut. Elliott went on to star in many movies and TV shows, and of course used his manly voice for “Beef. It’s what’s for dinner”. In 1984, Elliott married Katharine Ross (they are still married today). Ms. Ross became the dream woman of the 1960’s for many after appearing as Elaine in The Graduate and Etta Place in Butch Cassidy and the Sundance Kid. There are many individual scenes or moments that have become classics over the years: the bicycle scene while BJ Thomas sings “Raindrops Keep Fallin’ on My Head”; watching the great Strother Martin call Butch and Sundance morons as he spits chewing tobacco while riding a mule; the looks on their faces as Butch, Sundance and Etta arrive in the garden spot of Bolivia. It also remains one of the most quoted movies with eternal lines such as: “Who are those guys?” “I’m better if I move” “I’m not crazy. I’m colorful” “Think you used enough dynamite there Butch” “Are you crazy? The fall will probably kill you” and my personal favorite “You just keep thinking Butch. That’s what you’re good at”. Although it’s certainly a star vehicle for Newman and Redford, and to a lesser extent, Katharine Ross, the supporting cast is diverse and exceptional. In addition to Strother Martin and Sam Elliott, Butch has an infamous knife fight with Ted Cassidy (as Harvey Logan). Cassidy is the 6’9” actor who also played Lurch on TV’s “The Addams Family”. He is not 7’2” Richard Kiel who played Jaws in two James Bond films, though many people get them confused. 75 year old Percy Helton plays Sweetface. Mr. Helton had over 200 career screen credits dating back to 1915. Henry Jones plays the opportunistic bicycle salesman, George Furth plays the young and loyal Woodcock, and the still active today (at age 86) Cloris Leachman plays the working girl who is so giddy to see Butch again. The movie received 7 Oscar nominations and won 4: Cinematography (Conrad Hall), Original Score (Burt Bacharach), Original Song (“Raindrops Keep Fallin’ on My Head”), and Original Screenplay (William Goldman). It was also nominated for Best Picture, but that award went to the controversial Midnight Cowboy and its director John Schlesinger. It should also be noted that there was a 1956 movie titled The Three Outlaws that featured Neville Brand as Butch, and Alan Hale, Jr as Sundance. Mr. Hale is best known as the Skipper on “Gilligan’s Island”. In 1979 a pre-quel was released, Butch and Sundance: The Early Days. It featured Tom Berenger as Butch and William Katt as Sundance. Mr. Katt is best known as the unfortunate prom date in Carrie. Most recently, in 2011 Sam Shepard starred in Blackthorn, a film about an aging Butch Cassidy quietly hiding out in Bolivia. Greetings again from the darkness. This one showed up near the finish line of the classic Film Noir era, and has some features that make it stand out: unusual female characters, a quasi-parody feel, and a twisty ending unlike others from the genre. Based loosely on the Mickey Spillane pulp novel, the screenplay comes from A.I. Bezzerides, who is best known as the creator of the TV series “The Big Valley”. 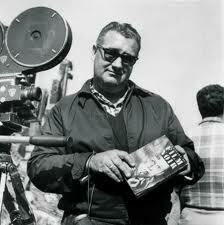 The biggest impact comes from director Robert Aldrich. Aldrich (pictured below) is a bit under-appreciated in Hollywood history having also directed Whatever Happened to Baby Jane; Hush, Hush, Sweet Charlotte; The Dirty Dozen; and The Longest Yard (the good one). Here he turns up the intensity on the Private Investigator story by having Mike Hammer (a terrific Ralph Meeker) be quite a bit more forceful and aggressive than Marlowe, Spade and the other famous movie PI’s. The film starts quite abruptly with one of the more fascinating beginnings in all of cinema. A panicky woman is running barefoot down a highway at night, wearing nothing but a bathrobe. That woman is Cloris Leachman (her screen debut) and she nearly causes Hammer to wreck his pristine Jaguar. Their relationship doesn’t end well, but it leads to a very unique torture scene that is almost entirely out the viewer’s sight line. Still, we quickly realize Hammer is in some deep trouble and he’s not the kind to let it be. Two other very interesting female characters are part of the story: Gaby Rodgers plays Lily Carver as a conniving trickster, and Maxine Cooper (pictured below with Meeker) is outstanding as Velda, Hammer’s trusty assistant and maybe more. Ms. Rodgers and Ms. Cooper have other common ground. They soon disappeared from Hollywood films as both married powerful men in the business. Rodgers married the famous songwriter Jerry Lieber, who wrote many Elvis Presley hits. and Cooper married an Oscar nominated writer, Sy Gomberg. 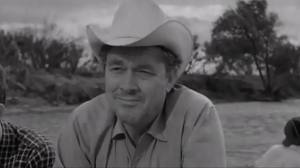 The cast features many prominent and recognizable actors of the time including Albert Dekker, Paul Stewart, Wesley Addy, Nick Dennis, Jack Elam, and Jack Lambert. 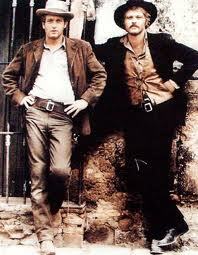 There is also a Butch Cassidy and the Sundance Kid connection. Strother Martin has a brief scene as does Percy Helton (as the Medical Examiner). In the Butch Cassidy movie, Martin is the colorful Bolivian payroll supervisor who hires the boys, and Helton is “Sweetface” who gives away their hiding place. Another note on Helton: he had one of the longest acting careers in history 1915-1978 (which was 7 years after his death). If you love films from the 40’s and 50’s, then this is a must see. It certainly has a place in Film Noir lore (say that three times quickly), and also has numerous other points of interest. Keep in mind that it was filmed at the height of the Atomic Bomb era … when scare tactics were the norm.